I really don’t know any other way to put it. It. Just. Does. I have spent my share of years grieving because of it. In fact, October kicks off a particularly difficult season because of it. My mother died in October, 23 years ago. My grandfather died October 22, three years ago. A beloved pastor passed away last October, and just this past year, a dear family friend, who was like an uncle, was taken away unexpectedly. Therefore, in the midst of the excitement in preparing for the holidays, the fall and winter often mark a time of sadness and grief. But, quite unexpectedly, the death of loved ones, and even those I do not know, have also become times of reflection for me. I reminisce about times past, and I grieve. But, there are also glimpses of a greater purpose. A reminder that I have been left behind for a reason. I am not an avid sports fan. 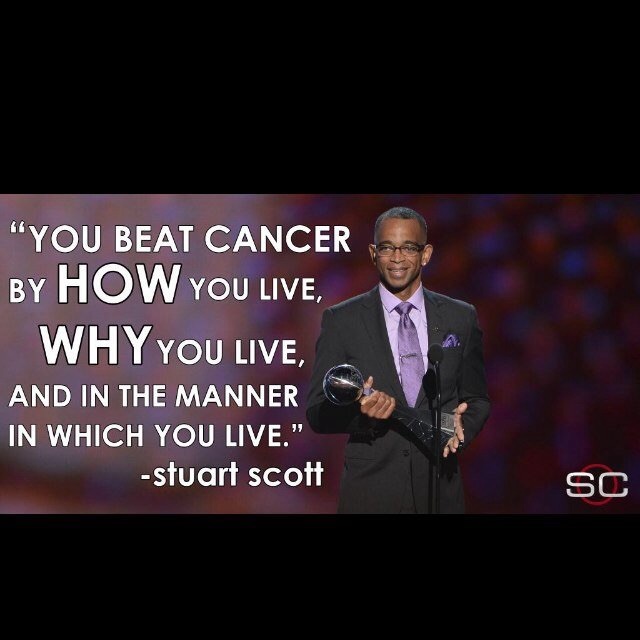 But, I do know who Stuart Scott is. In fact, he is one of a few analysts that I could readily identify. I admired how he carried himself on camera, how he interacted with others. He seemed to be a man of character. However, since I did not follow him, or his story, his death has come as quite a shock to me. I think of the things my mother did and the ways she impacted my life. How twenty-three years later, now, as a mother myself, I find myself doing and saying things that she did. It is amazing to see how she impacted my parenting in the 17 short years I had with her. She left her mark on my life. I often recall the fact that where my life is now is a result of my beloved pastor challenging me to use my gifts and get outside of my box. I accepted that challenge. Had he not challenged and encouraged me, I would not have applied for seminary in Dallas. Had I not moved to Dallas, I would not learned that I have an educator’s passion and a missionary’s heart. I would have missed multiple relationships. I would not have met the friend who told me about the ministry she served with. I eventually moved to Orlando to work with the same ministry. And it is thru that organization that I met my husband. Ten years, 3 states and 3 children later, here we are. He left his mark. As hard as death is for those of us who remain, it reminds us of one thing – to live. Several months ago, I read an article about twin brothers from Chattanooga who were found dead in their home, sitting side by side. While that sounds endearing, it was actually quite tragic. These brothers were found dead after 3 years. Yes. Three. For three years, no one missed them. The mailman assumed they moved away without leaving a forwarding address. A well-check performed by a police officer revealed nothing abnormal – they lived with shades drawn and no contact with neighbors, so nothing seemed amiss. Family members did not inquire about the lack of contact – it was normal, common. So for 3 years, no one missed them. No one. On a recent trip to the beach, I noticed footprints left behind. Marks in the sand. Some were made by flip flops, some by bare feet, others with tennis shoes. Different sizes. Different shapes. Some more noticeable than others. But, we all left them. Intentional or unintentional, we all left footprints. This made me think about legacy. Legacies are like footprints. We all leave them behind, intentionally or unintentionally, for good or bad, they are left. Once again, a death has occurred that makes me consider what I will choose to leave behind, footprints in the sand that will wash away with the tide, or firmly cemented in the lives of those who will live on beyond me. And it makes me ponder… Am I living my life in such a way that there will be a void in the lives of those around me? Or, will there be relief? Will people even notice? What difference would it have made that I was on this earth? Am I doing the thing(s) I was placed on this earth to do? What will be my footprint? What will be your footprint?